The 135th edition of the US Open, the fourth and final Grand Slam event of the year concluded at the USTA Billie Jean King National Tennis Center this year. Before the start, the scenario was – in the Men’s single section Marin Cilic was the defending champion whereas in the Women’s single section Serena Williams was the three-time defending champion. But as expected after the completion of the tournament, this year’s scenario is a completely different one. Unstoppable Serbian Novak Djokovic defeated Feliciano Lopez in four sets in a match that helped him to advance to the US Open semi-finals for a ninth consecutive year. Then he thrashed Marin Cilic, the defending champion to book a date with Roger Federer. It was the final people expected, and world number one Djokovic beat Federer in four dramatic sets to win his second US Open and 10th Grand Slam title. Though Federar lost this year, still the world number two remains on top of the list with 17 Grand Slam singles titles. For the first time in an all-Italian decider of the Open era Flavia Pennetta defeated Roberta Vinci in straight sets. In early stages of the tournament, Vinci had beaten the defending champion and world No one Serena Williams in an extraordinary match and the 26th seed Pennetta had beaten world No 2 Simona Halep. With this victory Flavia Pennetta became the first Italian to win US Open champion and it was also her maiden US Grand Slam title and interestingly it’s the last one too as she announced her retirement after the win. French pair of Pierre-Hugues Herbert and Nicolas Mahut won the Men’s Doubles trophy by defeating Jamie Murray (United Kingdom) and John Peers (Australia). After winning Wimbledon, BNP Paribas Open and WTA Family Circle Cup doubles title earlier, the pair of India’s Sania Mirza and Switzerland’s Martina Hingis won the women’s Doubles trophy by defeating Casey Dellacqua (Australia) and Yaroslava Shvedova (Kazakhstan) and clinched their fourth. 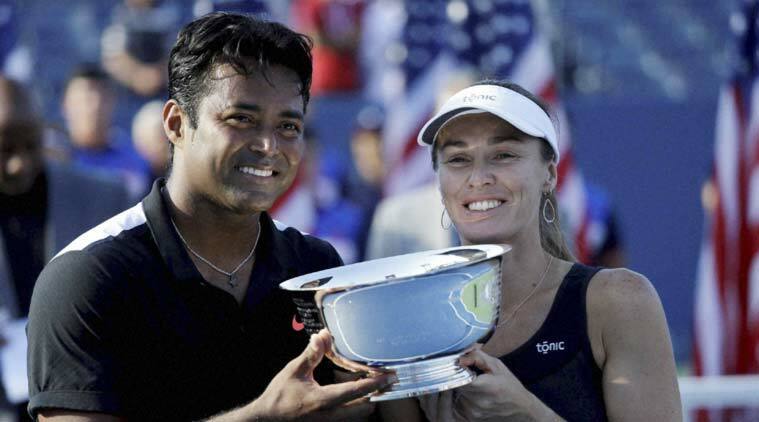 India’s Leander Paes and Switzerland’s Martina Hingis pair won the Mixed Doubles trophy of Final Grand Slam of the US Open by defeating American pair of Bethanie Mattek-Sands and Sam Querrey. The United States Open Tennis Championships is a hard-court tennis tournament which is the modern version of one of the oldest tennis championships in the world, the U.S. National Championship, started in 1881. Since 1987, the US Open has been chronologically the fourth and final tennis major comprising the Grand Slam each year. The other three are the Australian Open, French Open and Wimbledon. It’s held annually, starting on the last Monday in August, and lasting for two weeks into September. The main tournament consists of five event championships: men’s and women’s singles, men’s and women’s doubles, and mixed doubles, with additional tournaments for senior, junior, and wheelchair players. It is owned and organized by the United States Tennis Association (USTA), a not-for-profit organization. Net proceeds from ticket sales are used to promote the development of tennis in the US.